Not the most sophisticated but has all the important information! I'm so tired I don't have the strength to use BOLD or colours or exclamation marks or anything. But this result was enough to crack out the crayons - how's that money in the kitty?! In 5 years that is our best result ever! 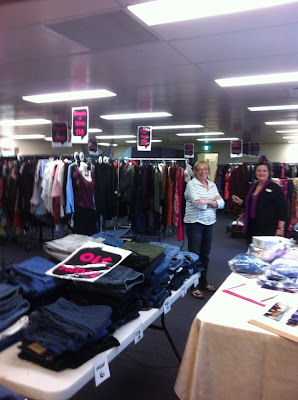 Went to the same venue, we ran a cafe, we ran a raffle, we ran a book stall - but most of all - we sold squillions of clothes. 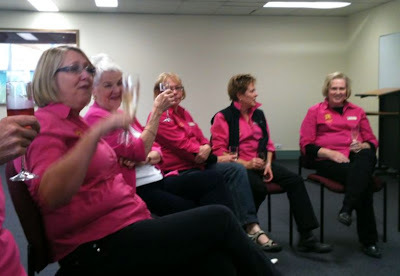 We copied this idea from our ZI President Lynn McKenzie and her club: Zonta Club of Wellington, New Zealand, when one of their members (Sharon - the Queen of thinking BIG) transferred to our club here in Canberra taught us how. And we all know the fabulous wardrobe Lynn has the joy of wearing! Z Cafe (said with a French accent) where we have rather over catered - it was CAKE for breakfast, lunch and dinner! I was the raffle queen. We were inundated with raffle prizes this year. It was all rather surprising and last minute and in truth we didn't take full advantage of the raffle situation. 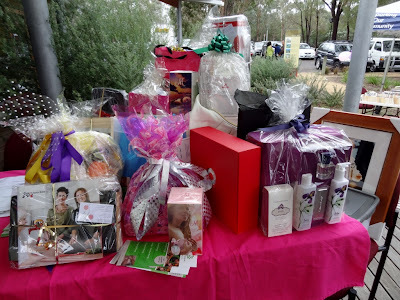 Crabtree & Evelyn toiletries, Longchamp travel goods, Chefs Toolbox kitchen implements, L'Occitane hair care, Nutrimetics facial, UltraTune Car Servicing, Alan White nail polish, Mariah Carey Perfume, Massages, dinner at Rama's, and Rod Stewart memorabilia made up our prizes. My favourite raffle prize story was a young 14 yr old who was SUPER excited at all the packages. She returned a few times to buy more tickets, hoping for something flashy! Delightfully she was the first person drawn and had her pick of ANYTHING. She choose to go to the salon and have a pedicure - what a fun experience for a young girlie!! When I rang her she was too excited to talk on the phone! Check out, bag up and pay up! 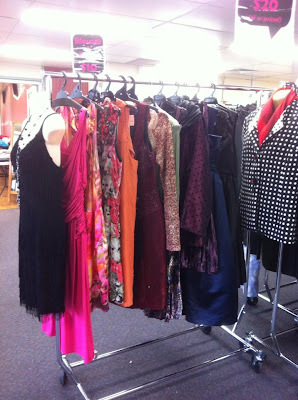 Over the years, we have saved our money and used government grants, accessed bargain sales and built up our stocks of clothing racks, coat hangers (oh - we have sooooo many hangers), mirrors, tables, and display stands. We are almost self-sufficient. We had some great donations this year, and have set up deals with local refuges and Working Wonders to take our excess. 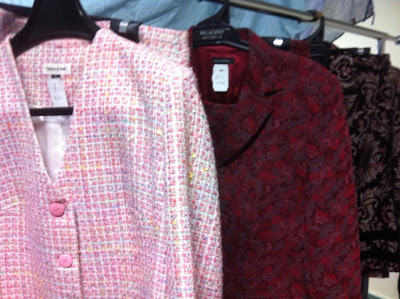 Another favourite story was of the woman who had donated a fabulous jacket she was no longer wearing. Over the weeks following she lost some weight and decided she wanted that baby back! 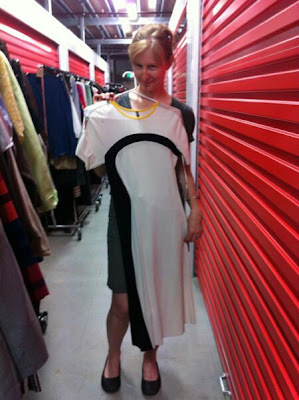 To her credit, she turned up at the sale and bought it. There are so many people who come together to make this work - to help us raise this astonishing amount, all of which is used to support our Zonta projects. From the people who donate, our members who sort, hang, lug, set up, pack down, bake, clean, promote and count. To the Hon Zon husbands - our 'muscle' who lift heavy things whilst we point in vague directions. And to the hundreds of women who attend our sale, year after year, and bring their friends and spread the word. Our Project Queen, Penny is planning on coming to Orlando and you can all meet her and hear her story. Only thing left to do is celebrate and bask in the moment! 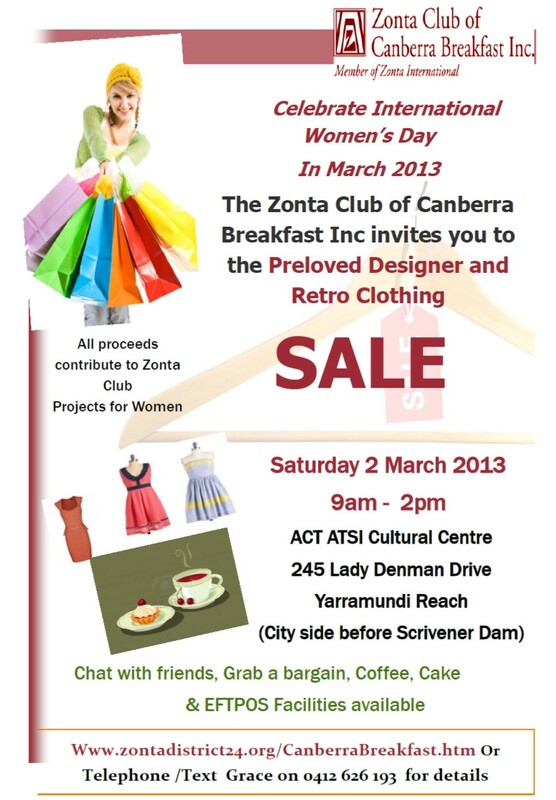 Thank you women of Canberra - today we came together to make a better world for women. 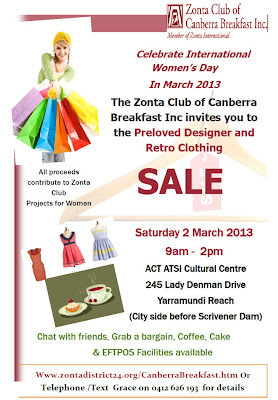 You can now join our new Zonta Club of Canberra Breakfast Facebook group and keep up with all our adventures. 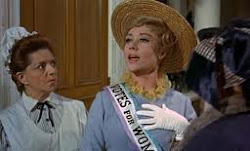 Do you want to profile your own club's fundraiser or service project here on Mrs. Banks? Contact me and let's work it out. 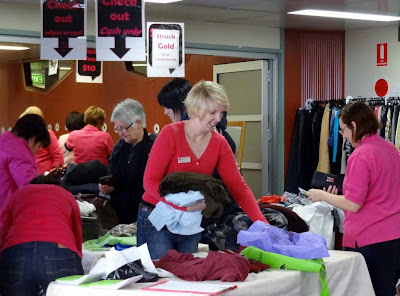 Oh - WOW - a new record breaker fundraiser for our club. Still smiling. Wow- an excellent result- well done Canberra!!! The idea started from Ruth Bruce's comment to me- when looking at my wardrobe- and needing to clean it out. Both of us were associated with a Trust - which made second chance education awards to women. 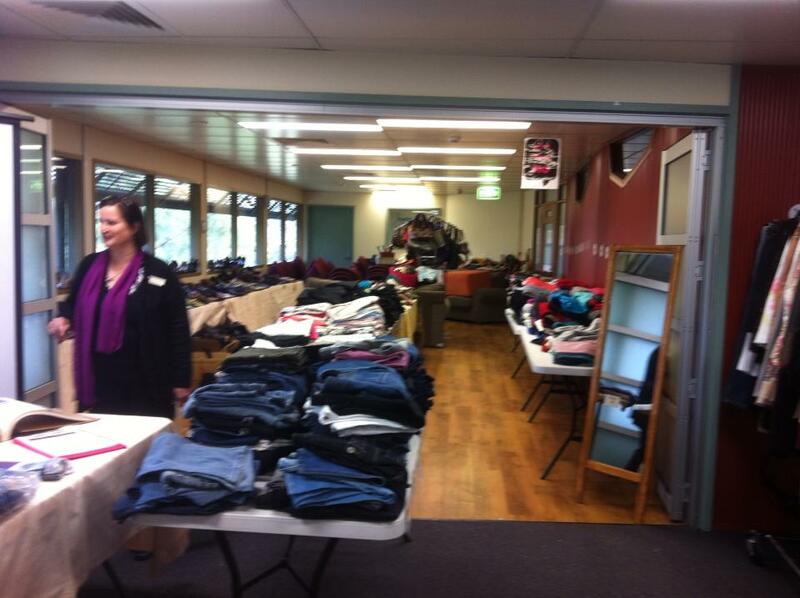 Second hand clothing for second chance education. Thanks for message Lynn! 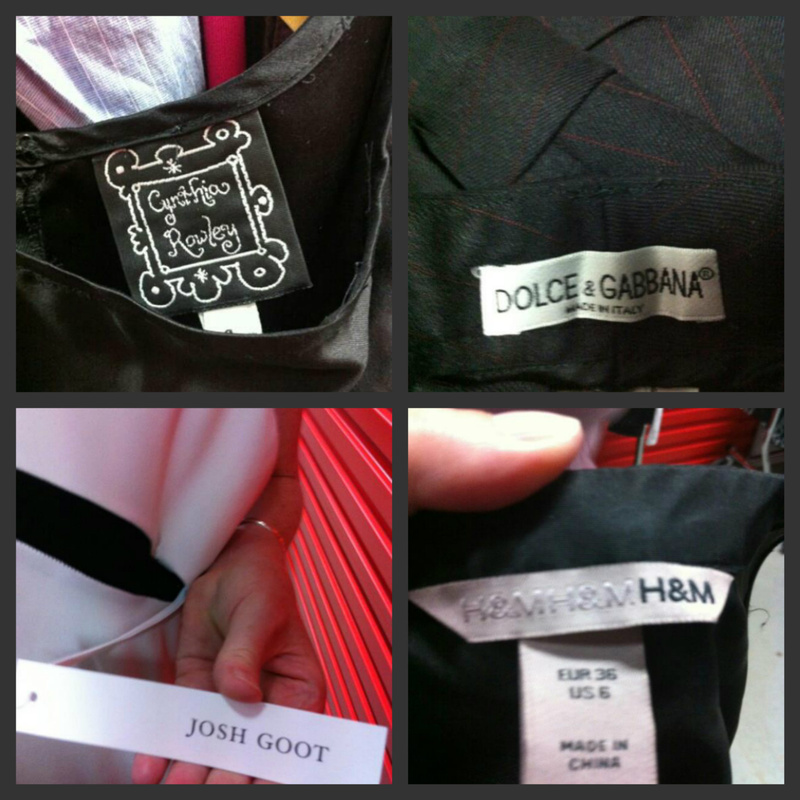 This is all very exciting for our members. This morning at Club meeting they did wish ZC Wellington well. And yes Lauren, Penny did catch up with SNK!